As a contrast to the previous set of abridged notes “The case for Censorship“, the following points are just a fraction of the various reasons why freedom of speech should be upheld despite the controversial or even harmful effects it might have on society. One example was the censorship of the Danish cartoons that millions of furious Muslims protested against in violent and terrible destruction around the world in the early 2000s. 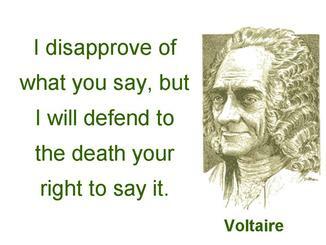 b) How caving in to pressure and censoring controversial or unpopular news might seem to give a victory to the fanatics or as our government would say, “the vocal minority”. In this case, it encourages those who instigated the violent protests herefore incite them to similar tactics in the future. c) Yet, as in all cases of censorship, the withdrawal of certain materials must be weighed against the greater good. In other words, the deliberate publication of sensitive or emotionally charged issues might seem irresponsible especially when it serves the interests of those responsible and reward their strategies of encouraging violence. Yet as expressed by Dworkin, Freedom of speech is not just a special and distinctive emblem of Western culture that might be generously abridged or qualified as a measure of respect for other cultures that reject it. Ridicule is a distinct category of free speech; its substance cannot be repackaged in a less offensive rhetorical form without expressing something very different from what was intended. Hence political cartoons and other forms of ridicule have for centuries been among the most important weapons of both noble and wicked political movements. Therefore in a democracy no one can have a right not to be insulted or offended. This principle is of particular importance in a nation that strives for racial and ethnic fairness. If weak or unpopular minorities wish to be protected from economic or legal discrimination by law, then they must be willing to tolerate whatever insults or ridicule people who oppose such legislation wish to offer to their fellow voters. Only a community that permits such insult as part of public debate may legitimately adopt such laws. Whatever multiculturalism means – whatever it means to call for increased “respect” for all citizens and groups – these virtues would be self-defeating if they were thought to justify official censorship. But we cannot make an exception for religious insult if we want to use law to protect the free exercise of religion in other ways. Religion must observe the principles of democracy, not the other way around. No one’s religious convictions can be thought to trump the freedom that makes democracy possible.